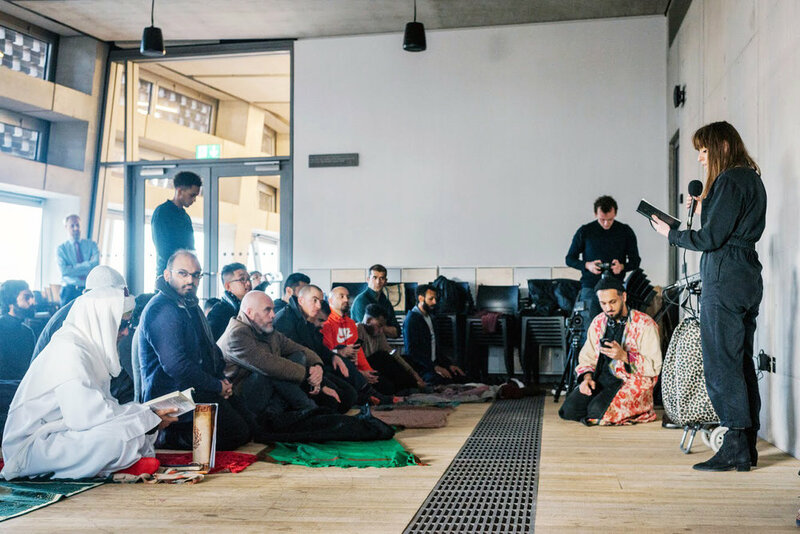 STUDIO JUM’AH was a NAAN-BINARY (re)imagining of the muslim Friday prayer, as a site of contemporary art & knowledge production vis-a-vis sacred devotion. It provided the opportunity to pray and create art as part of the same act; through a collaborative process, which took its inspiration from Vilém Flusser, a philosopher of new media, and Nasreddin Hodja, the Wise Fool of muslim traditions. Participants of any background were given a chance to explore how neo-diasporic artistic practice can engage with religious ritual, so as to transform the latter into a co-authored experience. Tangible aspects of the prayer relating to structure, hierarchy and knowledge were (re)positioned in light of the gallery space. Furthermore, this intervention interrogated the idea of a studio and gallery as sanctified spaces of western modes of modernity; spaces that often function as socially-removed and exclusionary - especially when it comes to diasporic bodies of flesh and praxis. Amaliah.com: The work encourages engagement with Muslims whilst being exhibited in a public space, what are your thoughts on Muslim culture being viewed under the ‘white gaze’? AZ: It’s fair to say that muslims are seen as a primary category of Other in Europe today and maybe that’s why it doesn’t feel like a public gallery is a relevant space in which to pray. Many anxieties have been raised by the mere suggestion of this act, which is why I find it necessary to bring these feelings to the surface. In doing so I also want to challenge the use of the word ‘muslim’ as an antagonistic signifier; to quote Rasheed Araeen “Being on the periphery does not necessarily mean the condition of surrogatory and submission. Periphery must have its own dynamic”; so I believe there is something I can access and activate here that goes beyond such binary notions of culture and race. Amaliah.com: Why did you specifically choose to share the experience of Jum’ah* (Friday) prayer as a part of your work? AZ: I wanted to present a work that could re-imagine the idea of a contemporary art space for Central Saint Martins Studio Complex with Tate Exchange. By choosing to host a Friday prayer I am making a statement which raises a number of questions. One of which is neo-diaspora getting the support they need from public and communal spaces to pursue artistic practice; for example, could a mosque host artist studios? Especially when many of them are empty, except on a Friday afternoon. The other issue is thinking about how contemporary galleries and arts institutions can become more accessible to diasporic bodies of flesh and praxis. Prayer itself is a deeply personal and sacred practice, which has this communal frame of congregation in Islam; I believe that these two can come together to form the basis of a creative ritual process, which can activate latent potential in a space like the Tate; and this can generate all kinds of knowledge and learning through the experiential and observational methods used by artists. With respect to establishing a congregation, there is this quality of dissolving the individual into a communal fold which I am really interested in. For many people this may be the only encounter of this kind they have on a regular or irregular basis, but it still isn’t accessible to everyone and there can be issues in the way that it’s structured in a lot of places. So by hosting it in a gallery it helps to open up the whole thing to anyone who is willing to take part. * Juma’h is not only the Arabic word for Friday, but it’s a literal reference to the act of establishing a gathering. Collaborators: Jumanah Moon, Lara Orawski, Hassan Vawdah, CSM, Hassen Rasool. Image documentation by: Anamarija Podrebarac, Heiba Lamara & Abbas Zahedi. * NAAN-BINARY is a collective alias instigated by abbzah to give rise to the decolono-sourdough technology of the neo-diaspora.